Pinterest is fast becoming one of my most visited sites, I could spend hours on there scrolling through endless hairstyles, decor ideas or even healthy recipes. Thanks to pinterest I've developed a rather unhealthy obsession with white floorboards, and I plan on having them in every room (or most rooms) in my future home! 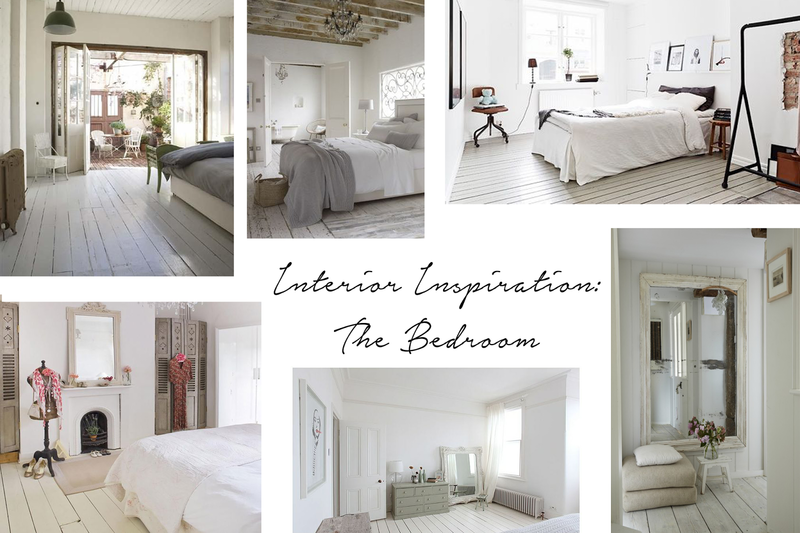 I love reading these room inspiration kind of posts so I thought I'd start doing them myself! When it comes to bedrooms, I love rooms that are calm and serene, it's where you sleep after all! I love the clean feel the white floorboards gives and I think it really brightens up a room. My own room is mostly white, with all white furniture but alas, I don't have white floorboards! Sometimes, all white rooms can look almost clinical and cold, so it's important to keep things a bit rugged looking. The top left and top middle photos are pretty much my perfect bedroom! From the worn white floorboards to the light and airy windows, they are ideal! Another thing I love in bedrooms are huge stand alone mirrors, the bigger the better in my opinion! Big mirrors reflect light if they're placed in a room correctly and also make the room look larger than it is. What does your ideal bedroom look like? Are you as big of a fan of white floorboards as me? Let me know in the comments! Thanks so much for reading, I hope you enjoyed this post!